Real Madrid got big games from three of its biggest stars to hold off an impressive new-look Panathinaikos 85-78 at the Community of Madrid Sports Palace in the Spanish capital on Friday night. Rudy Fernandez scored 23 points, Nikola Mirotic tallied 18 points and 8 rebounds and Sergio Llull was good for 15 points and 4 assists to lead Los Blancos. Madrid rode Fernandez to a 12-2 start, but the Greens never folded and former MVP Dimitis Diamantidis’s triple in the closing seconds of the first half made it 35-44 at the break. Mirotic came alive after a slow start with 6 points in an 11-0 run as the hosts came back. It was a 1-point game entering the fourth quarter and stayed close till the end, but with strong crowd support, Madrid hung on for the win. 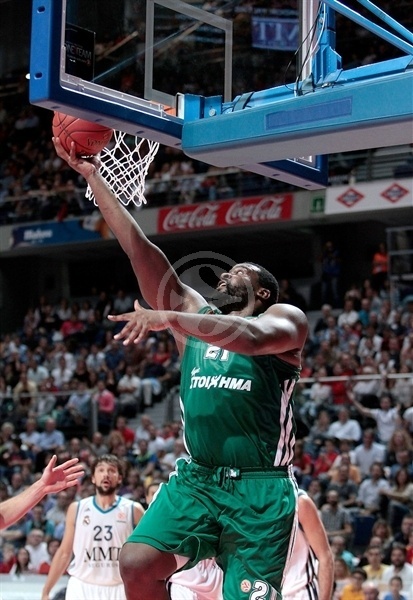 Sofoklis Schortsanitis was 9 for 9 from the field for 23 points for Panathinaikos. Diamantidis finished with 13 points and 6 assists, veteran Kostas Tsartsaris netted 10 as did Andy Panko in his Euroleague debut. It took Madrid only seconds to grab the lead as Marcus Slaughter batter the opening tip towards Fernandez, who darted to the hoop for a slam. The Fernandez show lasted for several minutes as the wingman drained a pair of three and rose for a block at the other end too. Los Blancos held the Greens scoreless for over three minutes before Schortsanitis came off the bench to score in the paint. 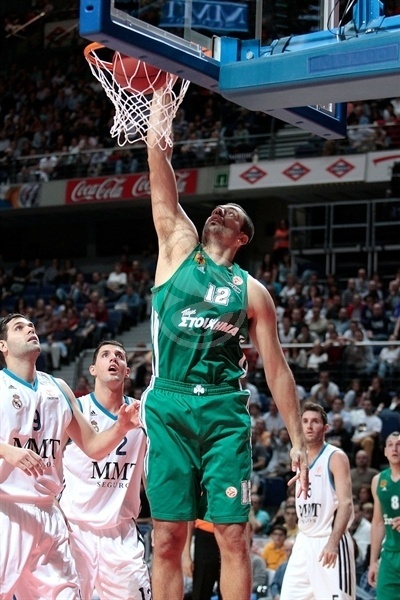 After A Llull layup and a Panathinaikos timeout, Rudy dunked to make it a 10-point game. 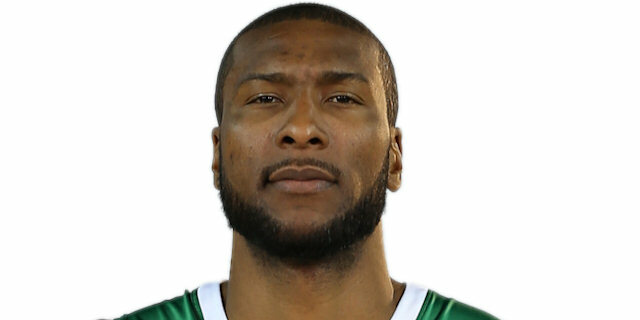 Big Sofo remained Panathinaikos’s chief weapon and added 2 from the line before Panko took a pass from Diamantidis for his first Euroleague points. But Madrid rolled on as Slaughter threw down a monster alley-oop and Llull connected from downtown to make it 19-6. Back-to-back Diamantidis triples kept the Greens afloat. And then Jonas Maciulis stole the ball from Mirotic and coasted in for a slam. The Panathinaikos run continued as Schortsanitis scored 2 more from the line and Panko fed Tsartsaris for a slam that cut the deficit to 19-18. Felipe Reyes finally ended a Madrid scoring drought with a follow basket-plus-foul and the hosts held a 22-20 lead after 10 minutes. A Mike Bramos jumper knotted the score early in the second quarter. Sergio Rodriguez sliced through the Green defense for a layup, but Roko Ukic matched him with a floater. Tsartsaris made a lefty layup to give Panathinaikos its first lead, 24-26, two-and-a-half minutes into the quarter. Sofo increased the lead to 26-30. Rudy added 2 from the line, but Panko hit back for the visitors. 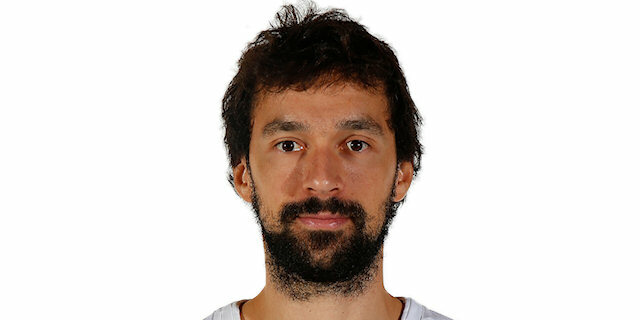 Mirotic sank a jumper to make it a 1-point game, however Schortsanitis and Tsartsaris – the latter from downtown – lifted Panathinaikos again. Fernandez got the crowd back into the game with a wild fastbreak layup-plus-foul. Dontaye Draper came in, got to the line and made it 35-37. Still the hosts had no answer for Big Sofo. A technical foul on Llull led to 2 Derwin Kitchen free throws and a 6-point edge. Diamantidis silenced the crowd with a triple in the closing seconds of the half to make it 35-44. Fernandez got to the line just 11 seconds into the second half and sent Maciulis to the bench with 3 fouls. Panko was in the right place at the right time for an easy layup. Llull got the crowd cheering with a triple and Draper came through with a steal and layup to close within 42-46. Mirotic was active on the glass and earned 2 free throws before rejecting Tsartsaris on the defensive end. Mirotic knotted the game from the line and then followed up Llull’s missed layup with a tip-in to cap an 11-0 run and put the hosts up 48-46. After a timeout, Panko tied it only to see a red-hot Mirotic answer. Schortsanitis came off the bench to score a pair of quick baskets and even things at 52-52. Rudy hit back with a big triple, but Bramos matched him at the other end. Rodriguez netted a foul line extended jumper, but Tsartsaris sank a three to put the Greens ahead. Slaughter countered with a highlight reel slam on Tsartsaris, but Sofo had the last word and made it 59-60 through three quarters. Big Sofo dunked and Bramos nailed another three as the Greens extended their lead to 61-65 in the first minute of the fourth quarter. Slaughter carried Los Blancos back with free throws and a bucket on the offensive glass. Jaycee Carroll put the hosts ahead with a free throw and Mirotic took a sweet pass from Rodriguez to make it 68-65. Ukic stretched on a drive to score, but Llull bettered him with a basket-plus-foul. 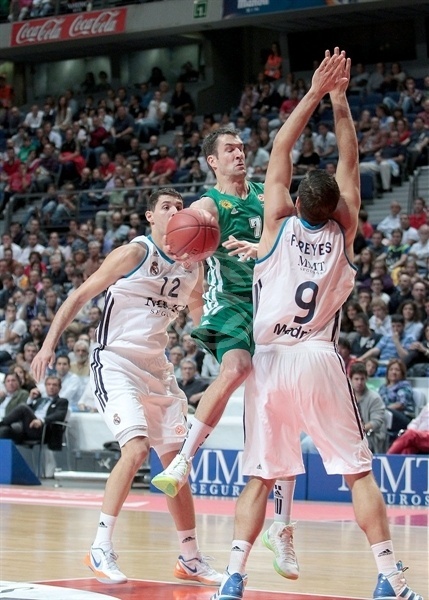 Diamantidis and Carroll traded baskets to get to 73-69 midway through the fourth quarter. Sofo threw down a two-handed slam, but the momentum remained with the hosts after Mirotic hit a jumper, drew a foul and drained the bonus shot. Then a Fernandez steal led to a Carroll dunk. 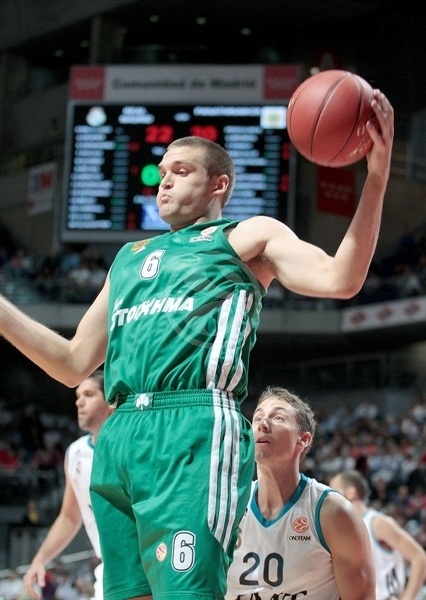 Diamantidis kept Panathinaikos alive from the line and Sofo made it a 4-point game with a free throw of his own. Fernandez brough the crowd to their feet with a tough, one-legged, fadeaway jumper to make it 81-74 with less than a minute and a half to go. Bramos missed a three and time started to run out on the visitors. Ukic made it a 5-point game with 38.7 seconds to play and Maciulis got it to 4 with 19.8 remaining, but the Greens got no closer and Rudy sealed the win with a slam in the closing seconds. 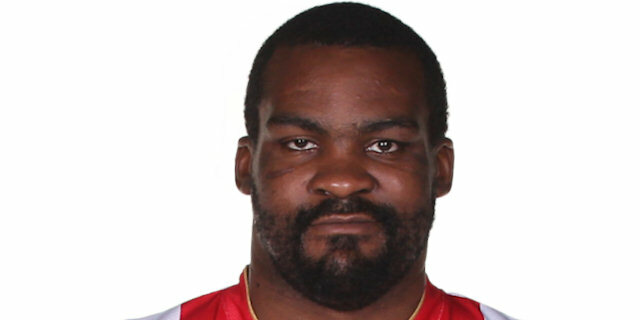 "First of all, I would like to congratulate both teams for a great game. It has been an important win because we managed to beat a good, rebuilt team like Panathinaikos. We lost the advantage we had in the second quarter. We improved our defense when we got back from the locker room and played a more attractive basketball." "I have mixed feeling. I am sad because we dominated the game and wouldn't win in the end, but happy because we played very smart basketball for a big while. Everything changed in the third quarter, when Madrid improved its defense playing with three guards. They gave us a lot of trouble and we committed many turnovers. We lost a nine-point lead but learnt a lesson from that. This is just our second official game this season." "Both are great teams. They have big players, maybe not tall, but very big. We played great defense in the second half. We didn't score as much as we are used to in the second quarter but defense helped us to get our scoring rhythm back. We battled hard against Schortsanitis and I think we managed to distract him in the second half, as he finished the game with 6 turnovers." "We had a good start of the game. The second half was critical for us and we managed to bounce back from the bad moment we had in the second quarter. We had a strong start after the break, improved our defense. Games like this, with so much intensity, are great but I prefer to win by 15 and not having a hard time." "Both teams have a lot of tradition. 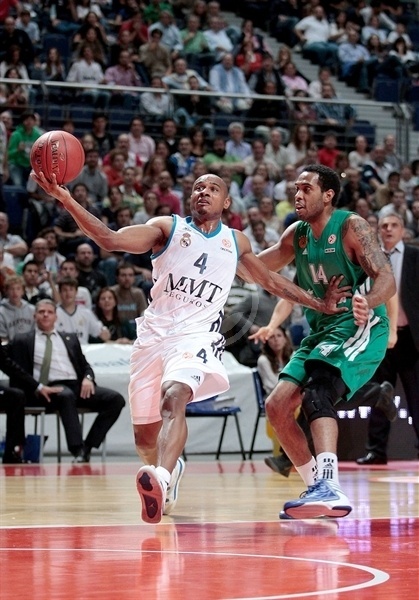 We may be a different team, but Panathinaikos must fight to make it to the Final Four. We learn things in every game - we committed many turnovers tonight. Nobody likes to lose and there are not many chances to get a road win in the Euroleague, especially against a team like Real Madrid. I am very happy to be in this team, even when we have only played two official games. 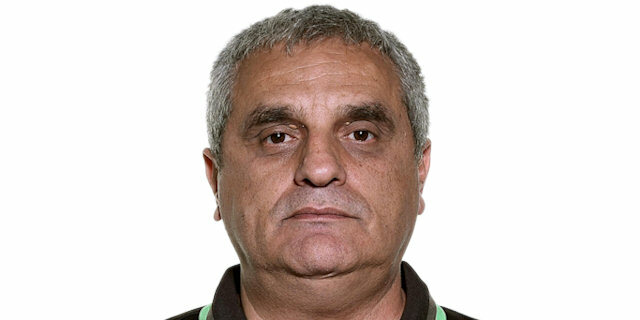 Everyone knows what it means to play for Panathinaikos. I will have a different role this season but I am hear to do what I am asked to do." 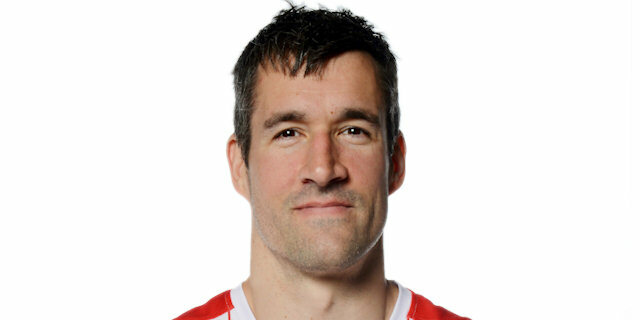 "It has been a very tough game between two great teams. We lost the game by small details. I played well, but that doesn't mean anything to me if we don't win the game. I played well because I have great teammates that helped me at all times."